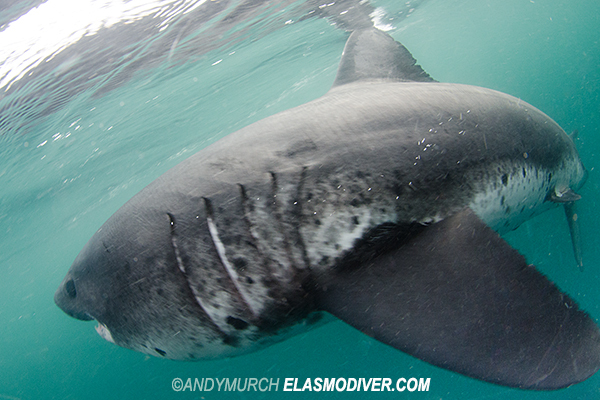 Salmon Shark Diving in Alaska. Published in Diver Magazine 2014. Just after midnight on the 24th of March, 1989, the Exxon Valdez struck Bligh Reef near Port Fidalgo, spilling more than 260,000 barrels of Alaskan crude oil into the pristine waters of Prince William Sound. Oil bled from the ruptured hull for three days until emergency response crews were able to stem the flow and siphon the remaining oil away. Government and industry clean up crews were immediately mobilized but containment efforts were hampered by the remoteness of the location as it was only accessible by helicopter, float plane or boat. Workers tried everything from solvents to controlled explosions to break down or burn off the toxic slick but their efforts failed to contain the bulk of the oil and within a few weeks the spill had contaminated 1,300 miles of Alaskan coastline and polluted 11,000 square miles of fertile ocean. It was the most devastating manmade environmental disaster in US waters until the Deepwater Horizon spill eclipsed it in 2010. Wildlife in the region suffered catastrophic losses. Somewhere between 100,000 and 250,000 sea birds died a horrible death, their feathers so clogged with oil that they were unable to fly to safety. At least 2,800 sea otters, 300 harbour seals, 247 bald eagles and 22 orcas also perished after becoming choked by the viscous crude. It was impossible to estimate how many fish died but migrating salmon and herring stocks were heavily impacted. During the clean up, high power hoses were used to power-wash sub tidal rocks. This proved to be an effective short-term solution to remove the oil but it also displaced most of the endemic microscopic organisms that belonged on the rocks. Later studies established that those same microorganisms play a critical role in the process of breaking down oil molecules so their removal actually slowed down the healing of the sound. Time and tides have washed away much of the visual evidence of the spill but there is still a great deal of oil trapped within the layers of sand on many beaches and the long term effects of polycyclic hydrocarbons and other pollutants are causing increased mortality rates in some species. It is estimated that it will take 30 years for mussel beds to rid themselves of contaminants and there is a very good chance that at least one of the remaining populations of orcas in the sound will eventually die out completely. There have been some successes. For example, sea birds soon repopulated the area from overcrowded roosts beyond the contamination zone and sea otters have already rebounded to pre-spill numbers. Earlier this year I led an expedition to Port Fidalgo to look for salmon sharks; a rarely photographed species of mackerel shark that looks rather like a small great white with an angry disposition. Although the focus was on one particular species, it was a great opportunity to see first hand how the underwater life of Prince William Sound is faring a quarter century after the spill. We based ourselves at Ravencroft Lodge; a remote fishing camp and a perfect base from which to chase salmon sharks that congregate in the inlet in early July each year to gorge themselves on spawning salmon. Heading out each morning on Dive Alaska’s well equipped expedition ship which had sailed in from Anchorage specifically for the expedition, we motored to a spot nicknamed Shark Alley because of the number of sharks that can be seen there. 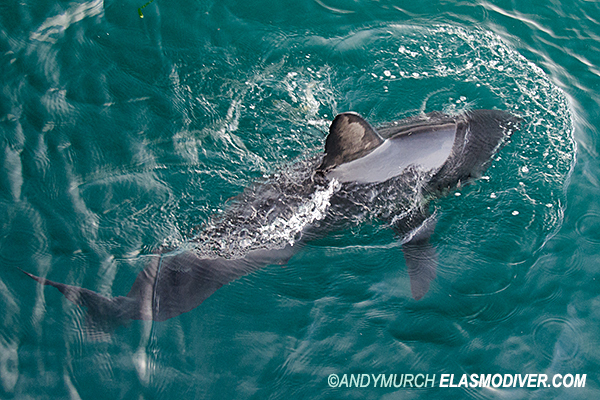 For reasons not yet understood, salmon sharks swim in tight circles for hours on end with their dorsal fins cutting the surface. Some researchers think they may be sleeping but circular swimming takes far more energy than ambling along in a straight line so there must be other factors at play. It may be that the behavior somehow helps them locate salmon. 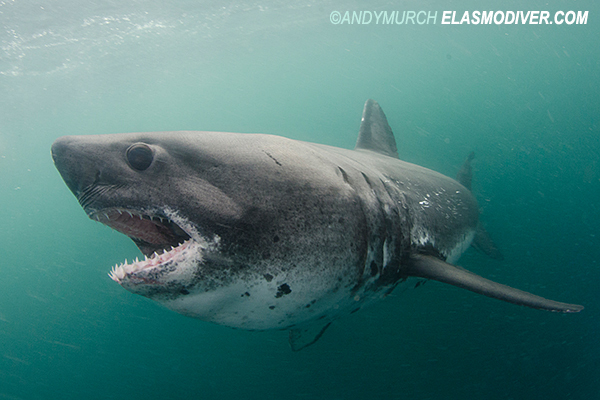 Although menacing in appearance, salmon sharks are extremely shy creatures. I tried slowly swimming up to a few of them as they circled, but it was almost impossible to close the gap before they snapped out of their trances and fled into deep water. Our attempts to chum them up to the boat were also completely ineffective so we decided to don tanks and try sitting on the bottom in the middle of Shark Alley hoping that one or two would simply swim by. 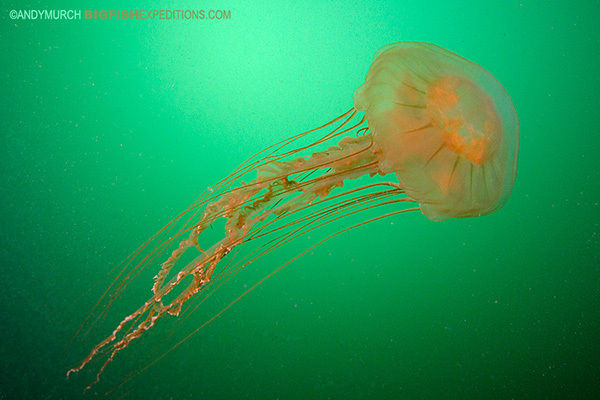 The first thing I noticed as I dodged lions-mane jellyfish on the way to the bottom, was how pleasantly warm the water was compared to dive sites much further south in Alaska and British Columbia. The south coast of Alaska is warmed by the Kuroshio Current that channels warmish water around the Aleutians from Japan. 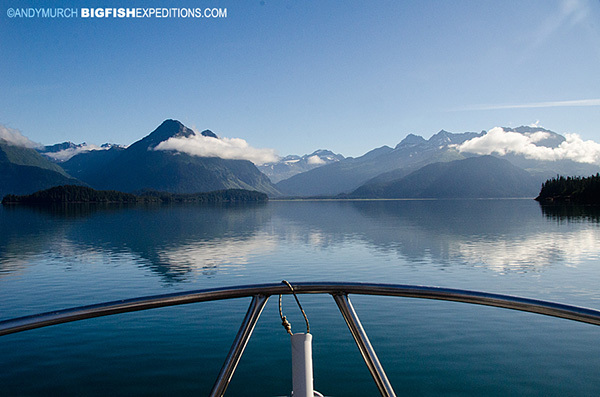 In the summer months, the temperatures in Prince William Sound can reach a balmy 60ºF. Species-wise, the scrubby kelp and crab infested substrate didn’t look that different from any other backwater dive site one would expect to see in the Pacific Northwest. Northern sculpins and arctic shannies scattered as I settled on the bottom and began my shark vigil. I stared into the green at the parade of different jellies for as long as my ADD would allow, then gave up on salmon shark spotting and went off to explore. There were no residual signs of the spill anywhere. 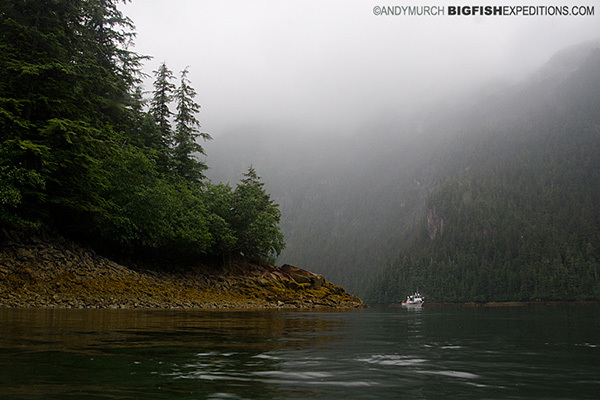 At 30m the scrubby slope gave way to a sheer rock wall populated by a who’s who of Alaskan rockfish species. In one crevice alone, I found duskies, darks, yellowtails, silvergreys, canaries, quillbacks, coppers, redstripes and the biggest yelloweye rockfish I’ve ever seen. 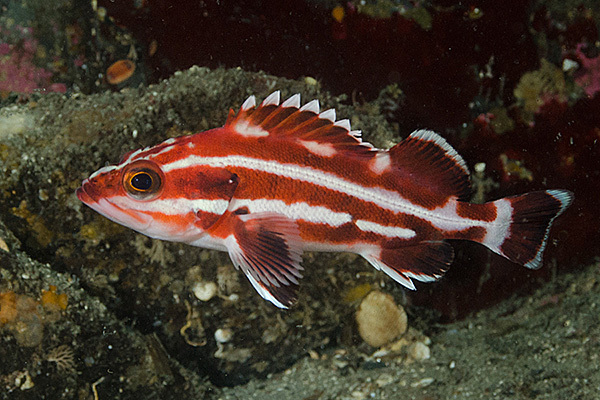 Rockfish live for many decades so the 2-3ft long elders would have been mature adults long before the Exxon Valdez filled the inlet with crude. I wondered if they were loaded with toxins but the presence of hundreds of healthy looking juvenile rockfish clearly showed that they’re having no trouble reproducing. 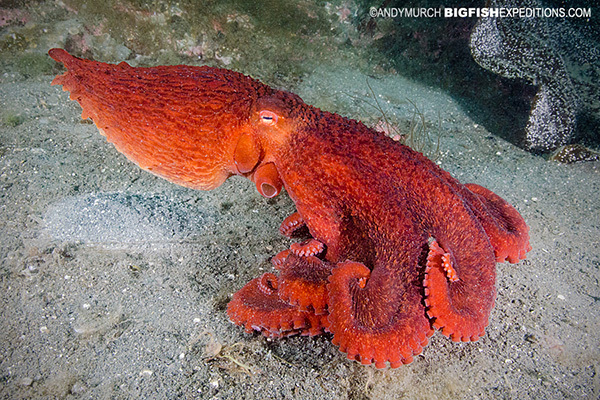 Drifting back up the slope, I stumbled upon a giant pacific octopus foraging out in the open. With nowhere to hide, the massive mollusk pulsed through every shade in its repertoire in an attempt to scare me off. After a few minutes it relaxed and settled onto a kelp frond perhaps wondering what my own flashing lights were trying to convey. Back at the lodge we hashed out a new shark attraction strategy. Returning to Shark Alley armed with boxes of frozen herring, we drifted as close as we could to the skittish predators and hurled a few fish in their path. 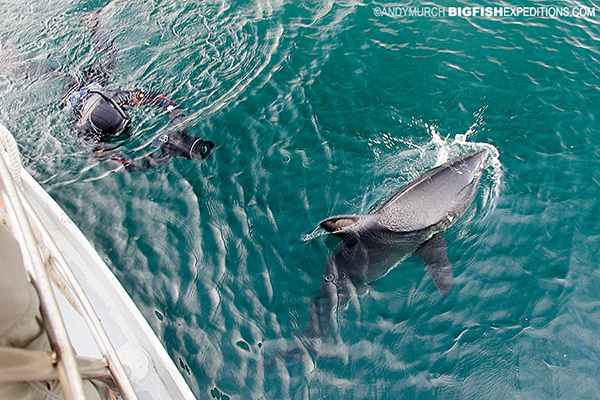 When a fish landed within two meters of a shark it would bolt instantly but if we aimed further away the sharks remained calm and a few actually changed course to intercept the sinking herring. Next we tied a herring onto a fishing line (with no hook) and slowly pulled it towards the boat. 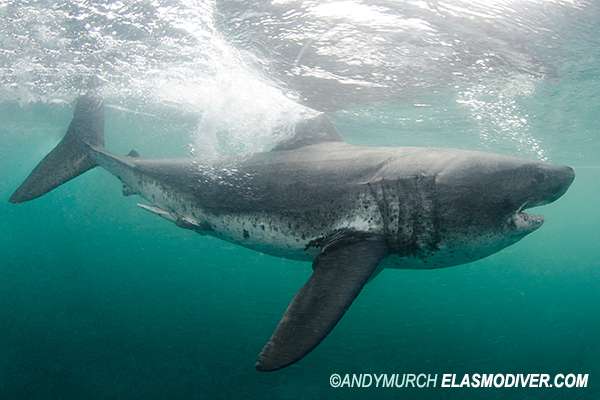 Once fixated with chasing the treats, the salmon sharks completely ignored the snorkelers that were lurking under the bow with their cameras at the ready. So oblivious were they in their single-minded desire to catch the fish that they came within inches of our dome ports and actually made contact with a snorkeler now and then. With plenty of dramatic salmon shark images in the bag, we spent the rest of the week pioneering new dive sites throughout Port Fidalgo. 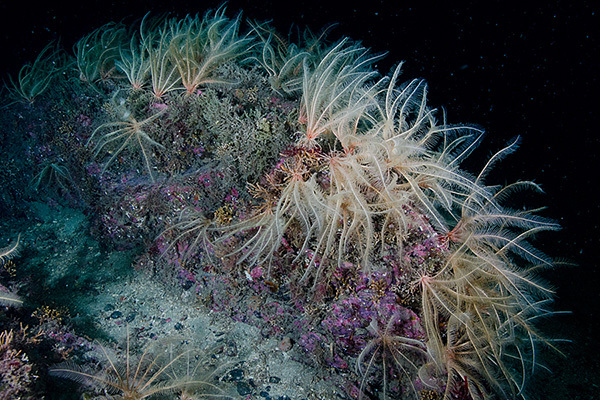 Virtually everywhere, we found rocky slopes bristling with northern feather stars. Distantly related to seastars, feather stars are a type of cold water crinoid that grasps the rock with one clawed foot and fans out its feathery arms to catch tiny marine organisms drifting by. As oil is lighter than water, many deepwater invertebrates and fishes escaped the initial effects of the spill. Consequently, there was plenty to see once we descended past the low tide line. 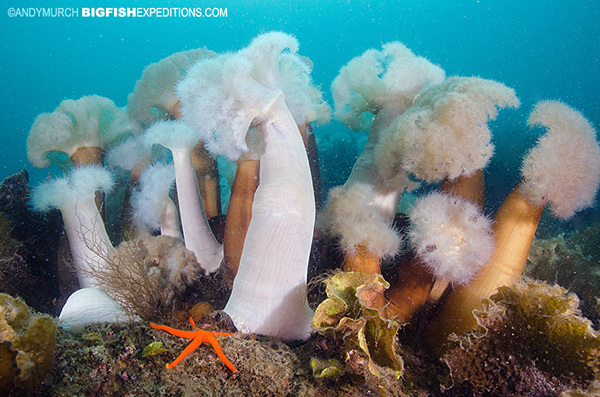 Dense tufts of plumose anemones adorned the tops of pinnacles and orange cup corals carpeted dark overhangs. Shrimps sprang away whenever we neared the bottom and decorator crabs sat motionless hoping in vain to remain undiscovered. 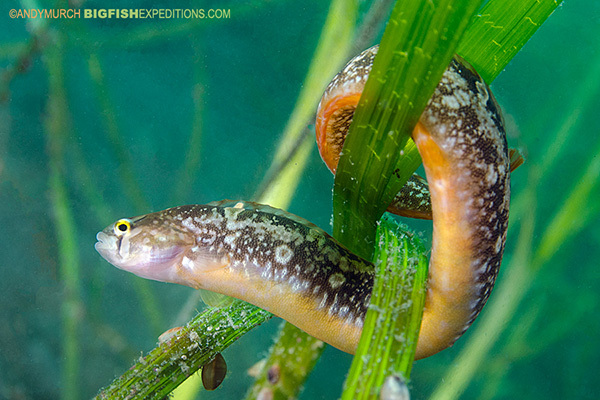 From tiny hooded nudibranchs to gigantic Alaskan tritonias, there were plenty of sea slugs to keep even the most jaded ‘brancher’ entertained and in the silty shallows we found endless banks of sea grass filled with helmet crabs and crescent gunnels. Perhaps some veteran divers would have noticed that certain species once prolific in the sound were now absent but to my new eyes, Prince William Sound’s underwater food web appeared to be doing just fine. On the way back to the lodge one day, we drove over an enormous moon jelly bloom. From the surface it appeared as an alien white glow emanating from the depths. 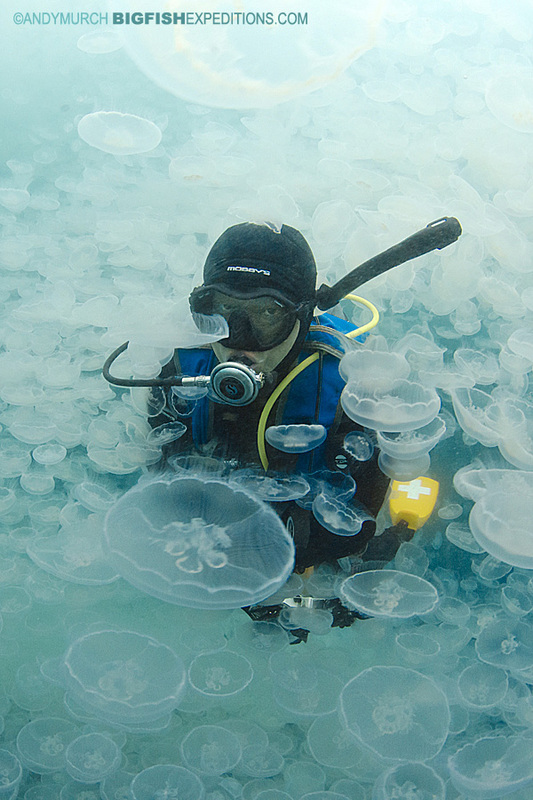 Donning almost empty cylinders, we slipped back in and swum through a thick cloud of jellies easily 100,000 strong. It was a surreal and unexpected encounter that I shall not soon forget. To polish off an excellent week of Alaskan diving, we explored some of the many river mouths around Port Fidalgo where pink and chum salmon were fighting their way upstream. 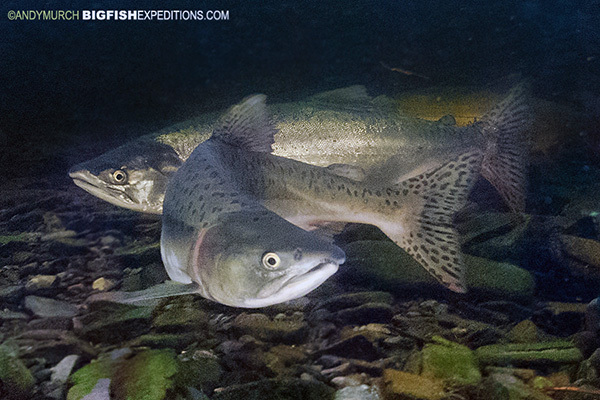 Young salmon leave the safety of the river after a year and spend their lives growing up in the open sea. Once mature, they fight their way back upstream to spawn and die. Watching them struggle against the flow of water reminded me of the larger picture. Faced with what seemed like insurmountable challenges, Prince William Sound has not just survived but is beginning to flourish once again. A testament to the tenacity of mother nature herself.